This question has been bugging me ever since I've started learning usability. 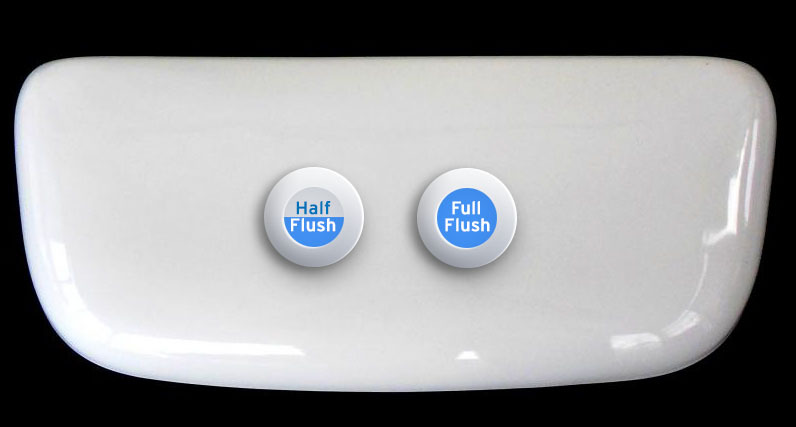 I am talking about the two buttons for the flush : Full and half container. On one hand, the button shape has to represent its function. Thus a bigger button must mean the full container. On the other, dangerous/heavy process triggers should be protected from being triggered by mistake and generally harder to trigger(If you press it, you mean it). From that point of view, the full container button should be smaller and further from the user and the half-container should be big and easy to reach/press. What are your thoughts on the matter? Have you ever seen a good, clear design, that is really intuitive? Do you know of any standards for this? NOTE: Please don't suggest text as a solution. Icons may be interesting. But I've never seen a clear icon for that. Because litres are a unit used everywhere across the world, a non-language dependent text solution is to label the amount of water used. Typically the symbol "L" is recognised as litres in almost any scenario. In addition, the two labels could be used as "wave to flush" sensors, if spaced far enough apart, preventing the spread of germs in public restrooms. Labelling the amount of water use in clear sight provides the benefit of educating users on water conservation. 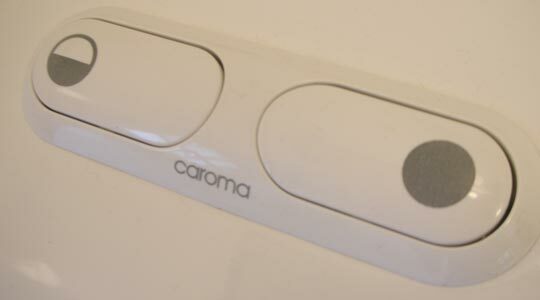 Anybody who uses a toilet with these buttons frequently could quickly respond to how much water a toilet uses. 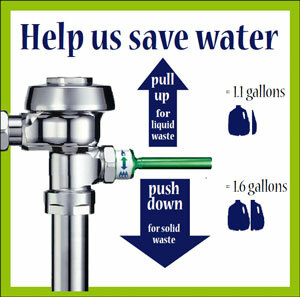 I think icons are the best possible way to convey the information about different flushing amounts. I see too much uncertainty by relying only on button relative sizes and ease of use. It can be a simple pictogram showing the tank in the relative size of water what will be flushed upon pressing that button. Or any other icons that conver relative size (like one droplet and 2 droplets) according to the style/design needs of the brand that produces those. Should be understandable by everyone, irrespective of culture. I think it's fairly obvious that . is the shorter flush and .. is the longer flush. Obviously text, "Short" & "Full" are self explanatory, but from a manufacturing point of view it becomes a logistical problem and those terms may not translate well in other languages. Saving water It only flushes while pressed, so that the user decides how much is enough. International There is no need for icons or labels, because there is only one button to press. Barrier-free One big button is easy to press for visual impaired. No additional instructions needed. Flexible design It could be a lever, a button or even a light sensor. It doesn't matter as long as it's only one. 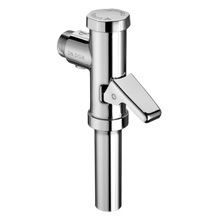 With a lever you could also control the water flow by pressing it only a little bit. I think a single lever was common in germany a few decades ago. Then there was a short hype 15 years ago, because they are saving water. But now they disappeared completely. The following button normally stops flushing when pressed on the top. It shouldn't be a problem to make it stop on releasing it. 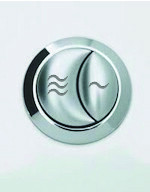 A google image search for toilet flush buttons brings up a surprising variety of designs. I didn't realise there were so many! 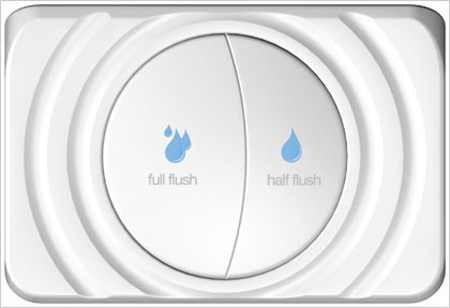 I reckon the small and large buttons representing small and large flushes respectively are the best. And then couple this with separating the buttons apart so that the large one is not easily pressed when you try to only press the small one. 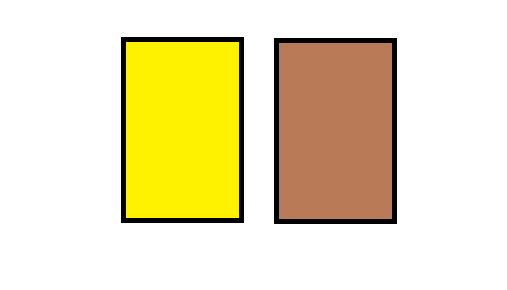 And then if icons were imprinted on top of these too e.g. large/small droplets then that may help further distinguish what they are. You push it half way to the right for a little flush and all the way to the right for a big flush. A Big flush would be more work, as you have to push the slider all the way to the right. If the Slider has an Arrow-Shape and there is a small drop half-way and a big Drop on the right, it would be easy to understand. The toilets my college use have a fairly intuitive design. That is, pull in the direction of 1 water droplet to flush with less water, and push in the direction of 3 water droplets to flush with more water. This is me speculating, but I can also see how pulling/going up could relate to something being 'lighter' and thus mean less water, and vice versa. I imagine a similar icon set could be used on buttons. I started off with icons only and ran a test with my uncle who is in his 80's. He seemed a little confused but finally figured it out. Adding text does facilitate icons but it might not assist in non-English speaking countries. Buttons are not a good UI when the operator is likely to have soiled hands when using them. Auto-flush toilets have existed for many years now, and the technology is both cheap and mature. The only barrier to adoption is patents and the common requirement that bathrooms have minimal electrical wiring. First of all, the buttons are equal size, so that isn't confusing. Also, it has water droplets on it so someone can see the right button will give more water. If you make it large enough, the blue water "waves" will give the user a quick indication without a lot of mental activity. Curious what the little "tab" is there for? (It's the little red squiggle over the left button) I think that might be a good idea for a user. If they push the right button, it'll technically push down both buttons. If they push down the left button, it would push down only one button. I don't know if users would appreciate this, but it might be only logical that if they push half of the buttons, they get half of the water. I'd say do a little more research (especially with younger children) to see if they get this or not before implementing this. Take the decision out of the hands of users. 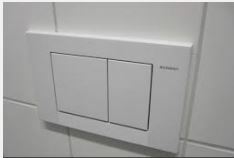 Have one button but make the toilet smart based on level of displacement, it wouldn't need an electronic sensor, just a better designed bulb in the reservoir right? Or possibly an extra pressure tube similar to how a barometer works? As the toilet is filled higher and with denser material the physical pressure of that mass should dictate how much water is used. For special cases they may need to flush twice. 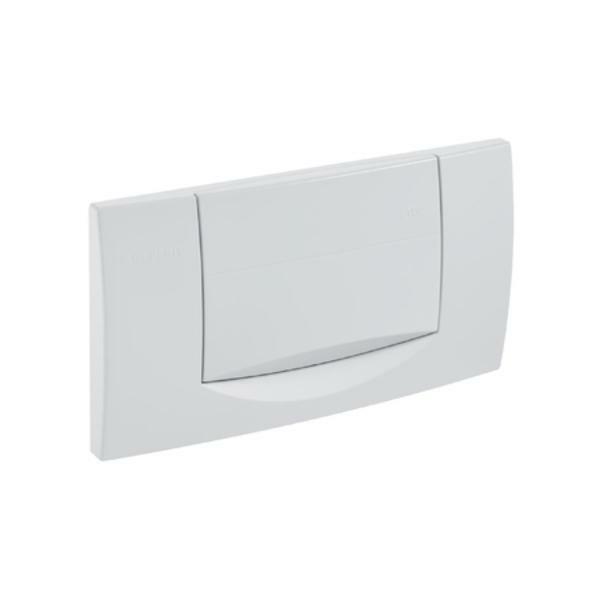 I think Falco's answer is a good start, but the general idea could also work with the existing lever design: push the lever half-way for a "light" flush, or all the way for the full flush. The lever should take a bit more force to complete the full flush so that people don't unwittingly always push it as far as it will go. Since the feedback is occurring in real-time, the user will instantly know if the flush was, ahem, insufficient. And in that case, a natural response is to push the lever again, but harder. If you wanted to let folks know exactly what was happening, you could post a diagram on the wall showing the lever depressed half-way with one drop of water beside it, and fully depressed with three drops of water beside it. There's a trend in the US to get rid of the handles and buttons completely. 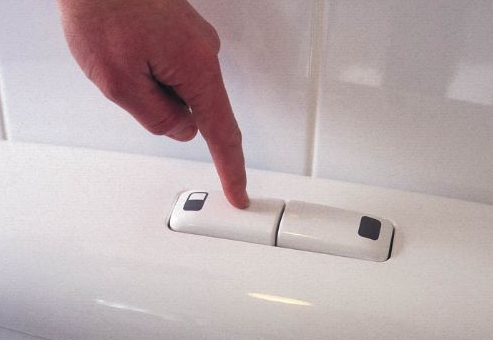 Sensors determine when the person has moved and auto flush. Sinks dispense water while hands are under the faucet and dryers auto turn on. Pretty much the only thing left in a bathroom to physically touch is the door on the way out. Which, ultimately, is why I prefer single dispense paper towels over air dryers. Seems to me that the best thing for humans is to have as little contact as possible in that room. I just don't think there is a good water use case that would require the user to pick from 2 different flush settings. As the designer, pick the smaller one. If it's not enough, a second flush should take care of whatever was left. If it doesn't then you probably need to look at your toilet design anyway. Also, I've seen several places with urinals that do not require flushing. I haven't bothered to look into how that works or whether it's better/worse for the environment but it certainly represents another approach. 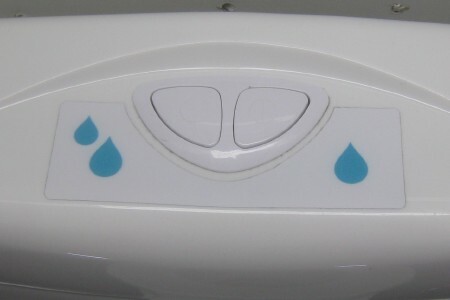 One button should be fitted which is the water saving option and then if the user finds that this is insufficient a second flush (within a certain time period) should then produce a larger flush of water. Bearing in mind the comments below I'd modify my suggestion to one button which can be just pressed as needed: short (small distance down) press down for small amount of water, longer (further depression) press for larger amount of water. So one button with a two stage action. Acoustic sensor in the u-bend that detects the density of the deposit you have made using pulses of sound. Place a single button to trigger a flush. The on board computer can then detect a #1 or #2 and flush accordingly. Computer then charges battery using a water wheel. FLAWLESS. What could possibly go wrong? 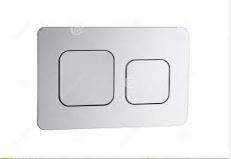 I cannot remember where now or find a picture, however I have seen in the past the buttons being roughly equally sized but the half flush symbolized by a half circle and the full flush a full circle. This to me makes the meaning clear without giving the implications given by different sized buttons. 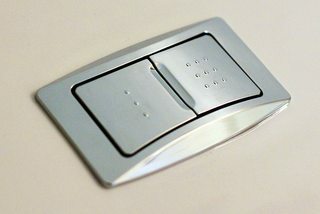 I find toilet buttons a huge design flaw because after nearly two decades of toilet usage I have to find out the truth from a question in User Experience. I always tried to find out why there are two buttons and what the size means. I thought one button empties all the tank and the other button flush water as long as I press it, because sometimes I really just need a little flush. Never mind, after I tried it I realized I am wrong. Icons make it totally understandable, so I mixed a few answers here to create the one solution which I think is the best. The colour and text concepts... priceless! 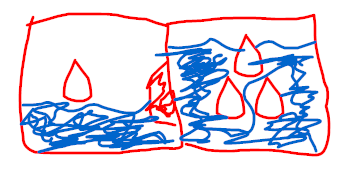 I believe the visuals which show a lot of information regarding water level and toilet shape are too much. This is definitely somewhere you need to have simple and elegant design language. The button I see most often is akin to a Yin-yang symbol. One slightly smaller than the other. Not the answer you're looking for? Browse other questions tagged interaction-design buttons physical or ask your own question. Why did browsers get rid of the standard menu across the top and now have one button in the top left corner?